The taxi picked me up at 4:30 am in the morning. The first leg to Amsterdam took a good 60 minutes, leaving Nuremberg Airport at 6:00am. Connection time in Schiphol for the intercontinental flight to Portland is a good two hours, most of which is taken by the security controls before boarding a flight to the US. When I’m lucky I have time for a quick coffee in the KLM Lounge and doing a first round of business e-mails and a quick call or two. The westbound flight to PDX takes about 10h 30 mins. Delta changes its meal selection every three months, so doing this trip twice a month there is no surprise about the food I will get. I don’t even bother to take the menu any more. Another nasty disadvantage of a frequent traveler is the movie selection. Having roughly 40 hours of flight time a month there is also not much left to see on the inseat entertainment system. Typically I load a couple Netflix movies on my iPad and use this, normally watching one movie per flight while eating. After the food I usually take a short nap on the westbound flights which are day flights. 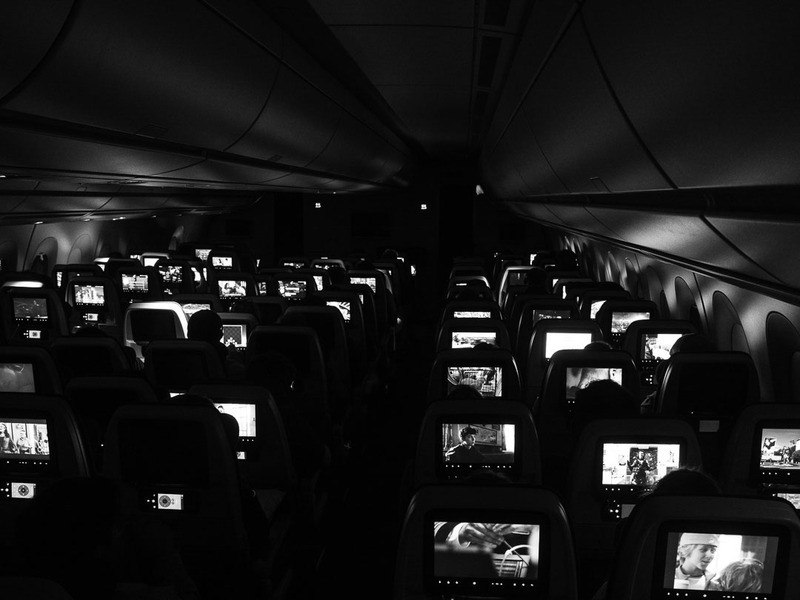 Then I usually work the rest of the flight, which is quite nice as there is no telephone that disturbs, but a good WiFi connection so I have email access. I took this image with my Olympus PEN-F and the mZuiko 12-40mm F/2.8 Pro Zoom. Image specs are 1/15 sec @ f/3,2 and ISO 1600. Raw and monochrome conversion in Lightroom CC Classic. I wish all of you a great and stress free Wednesday! This is such a great image – it’s almost abstract. That is an awesome photo. I love your photography. I love this shot Marcus. It’s almost like a sneak peek into the lives of the flyers since the movie selections are so varied. It amazes me that the TV’s are so crisp. Mostly because nighttime photography is my nemesis. I suspected that that much travel would be rough, but seeing it written out is still shocking. And to think I’m concerned about the fact that I’ll land in London at 8:00 am, which will feel like 3:00 am, my time and it’s likely I will have issues sleeping because it’s only an 8 hr 40 min flight and leaves at 6:30 pm, my time. However, I’m super excited that it’s a nonstop flight. We had rather long layovers in Iceland last year and the airport doesn’t have much to do. What a cool perspective in black and white!! Great shot of the interior of the plane. First time to see such an interesting way of photographing a common scene. Your statement is very true. Yikes! What a grueling commute! Jim took the words right out of my mouth.